1 In Thee, Jehovah, do I take refuge, Let me not be put to shame for ever. 2 In Thy righteousness deliver me and rescue me, Bend Thine ear and save me. 3 Be to me for a rock of habitation to go to continually: Thou hast commanded to save me, For my rock and my fortress art Thou. 4 My God, rescue me from the hand of the wicked, From the fist of the evil-doer and the violent man. 5 For Thou [art] my hope, O Lord Jehovah, [Thou art] my trust from my youth. 6 On Thee have I been stayed from the womb, From my mother's bowels Thou hast been my protector: Of Thee is my praise continually. 7 As a wonder am I become to many, But Thou art my refuge--a strong one. 8 My mouth is filled with Thy praise, All the day with Thine honour. 9 Cast me not away in the time of old age, When my strength fails, forsake me not. 11 Saying, God has left him, Chase and seize him; for there is no deliverer. 12 O God, be not far from me, My God, haste to my help. 13 Ashamed, confounded, be the adversaries of my soul, Covered with reproach and confusion be those who seek my hurt. 14 But as for me, continually will I hope, And add to all Thy praise. 15 My mouth shall recount Thy righteousness, All the day Thy salvation, For I know not the numbers [thereof]. 16 I will come with the mighty deeds of the Lord Jehovah, I will celebrate Thy righteousness, [even] Thine only. 17 O God, Thou hast taught me from my youth, And up till now I declare Thy wonders. 18 And even to old age and grey hairs, O God, forsake me not, Till I declare Thine arm to [the next] generation, To all who shall come Thy power. 19 And Thy righteousness, O God, [reaches] to the height. O Thou who hast done great things, Who is like Thee? 20 Thou who hast made us see straits many and sore, Thou wilt revive us again, And from the abysses of the earth will bring us up again. 21 Thou wilt increase my greatness, And wilt turn to comfort me. 22 Also I will thank Thee with the lyre, [even] Thy troth, my God, I will harp unto Thee with the harp, Thou Holy One of Israel. 23 My lips shall sing aloud when I harp unto Thee, And my soul, which Thou hast redeemed. 24 Also my tongue shall all the day muse on Thy righteousness, For shamed, for put to the blush, are they that seek my hurt. Echoes of former psalms make the staple of this one, and even those parts of it which are not quotations have little individuality. The themes are familiar, and the expression of them is scarcely less so. There is no well-defined strophical structure, and little continuity of thought or feeling. Vv. 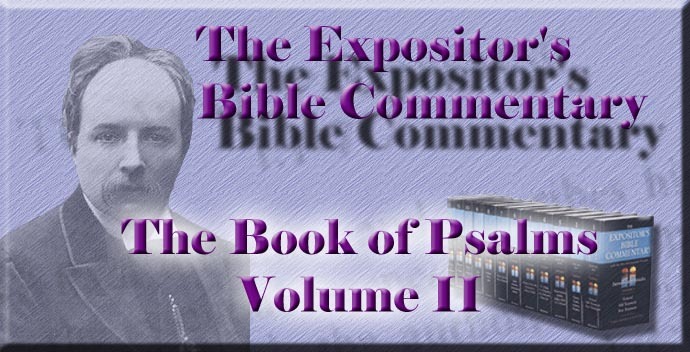 13 and 24 b serve as a kind of partial refrain, and may be taken as dividing the psalm into two parts, but there is little difference between the contents of the two. Delitzsch gives in his adhesion to the hypothesis that Jeremiah was the author; and there is considerable weight in the reasons assigned for that ascription of authorship. The pensive, plaintive tone; the abundant quotations, with slight alterations of the passages cited; the autobiographical hints which fit in with Jeremiah's history, are the chief of these. But they can scarcely be called conclusive. There is more to be said for the supposition that the singer is the personified nation in this case than in many others. The sudden transition to "us" in ver. 20, which the Massoretic marginal correction corrects into "me," favours, though it does not absolutely require, that view, which is also supported by the frequent allusion to "youth" and "old age." These, however, are capable of a worthy meaning, if referring to an individual. Vv. 1-3 are slightly varied from Psalm xxxi. 1-3. The character of the changes win be best appreciated by setting the two passages side by side. 1 In Thee, Jehovah, do I take refuge; let me not be ashamed for ever: In Thy righteousness rescue me. 2 a Bend Thine ear to me; deliver me speedily. 1 In Thee, Jehovah, do I take refuge: Let me not be put to shame for ever. 2 In Thy righteousness deliver me and rescue me: Bend Thine ear and save me. 2 b Be to me for a strong rock, for a house of defence to save me. 3 For my rock and my fortress art Thou. 3 Be to me for a rock of habitation to go to continually: Thou hast commanded to save me; For my rock and my fortress art Thou. The difference between "a strong rock" and "rock of habitation" is but one letter. That between "for a house of defence" and "to go to continually: Thou hast commanded" is extremely slight, as Baethgen has well shown. Possibly both of these variations are due to textual corruption, but more probably this psalmist intentionally altered the words of an older psalm. Most of the old versions have the existing text, but the LXX. seems to have read the Hebrew here as in Psalm xxxi. The changes are not important, but they are significant. That thought of God as a habitation to which the soul may continually find access goes very deep into the secrets of the devout life. The variation in ver. 3 is recommended by observing the frequent recurrence of "continually" in this psalm, of which that word may almost be said to be the motto. Nor is the thought of God's command given to His multitude of unnamed servants, to save this poor man, one which we can afford to lose. Vv. 5, 6, are a similar variation of Psalm xxii. 9, 10. "On Thee have I been stayed from the womb," says this psalmist; "On Thee was I cast from the womb," says the original passage. The variation beautifully brings out, not only reliance on God, but the Divine response to that reliance by life-long upholding. That strong arm answers leaning weakness with firm support, and whosoever relies on it is upheld by it. The word rendered above "protector" is doubtful. It is substituted for that in Psalm xxii. 9 which means "One that takes out," and some commentators would attach the same meaning to the word used here, referring it to God's goodness before and at birth. But it is better taken as equivalent to benefactor, provider, or some such designation, and as referring to God's lifelong care. The psalmist has been "a wonder" to many spectators, either in the sense that they have gazed astonished at God's goodness, or, as accords better with the adversative character of the next clause ("But Thou art my refuge"), that his sufferings have been unexampled. Both ideas may well be combined, for the life of every man, if rightly studied, is full of miracles both of mercy and judgment. If the psalm is the voice of an individual, the natural conclusion from such words is that his life was conspicuous; but it is obvious that the national reference is appropriate here. On this thankful retrospect of life-long help and life-long trust the psalm builds a prayer for future protection from eager enemies, who think that the charmed life is vulnerable at last. Vv. 9-13 rise to a height of emotion above the level of the rest of the psalm. On one hypothesis, we have in them the cry of an old man, whose strength diminishes as his dangers increase. Something undisclosed in his circumstances gave colour to the greedy hopes of his enemies. Often prosperous careers are overclouded at the end, and the piteous spectacle is seen of age overtaken by tempests which its feebleness cannot resist, and which are all the worse to face because of the calms preceding them. On the national hypothesis, the psalm is the prayer of Israel at a late stage of its history, from which it looks back to the miracles of old, and then to the ring of enemies rejoicing over its apparent weakness, and then upwards to the Eternal Helper. Vv. 12, 13, are woven out of other psalms. 12 a, "Be not far from me," is found in xxii. 11, 19; xxxv. 22; xxxviii. 21, etc. "Haste to my help" is found in xxxviii. 22; xl. 13 (lxx. 1). For ver. 13 compare xxxv. 4, 26; xl. 14 (lxx. 2). With this, as a sort of refrain, the first part of the psalm ends. The second part goes over substantially the same ground, but with lighter heart. The confidence of deliverance is more vivid, and it, as well as the vow of praise following thereon, bulk larger. The singer has thinned away his anxieties by speaking them to God, and has by the same process solidified his faith. Aged eyes should see God, the helper, more clearly when earth begins to look grey and dim. The forward look of such finds little to stay it on this side of heaven. As there seems less and less to hope for here, there should be more and more there. Youth is the time for buoyant anticipation, according to the world's notions, but age may have far brighter lights ahead than youth had leisure to see. "I will hope always" becomes sublime from aged lips, which are so often shaped to say, "I have nothing left to hope for now." This psalmist's words may well be a pattern for old men, who need fear no failure of buoyancy, nor any collapse of gladness, if they will fix their thoughts where this singer did his. Other subjects of thought and speech will pall and run dry; but he whose theme is God's righteousness and the salvation that flows from it will never lack materials for animating meditation and grateful praise. "I know not the numbers thereof." It is something to have fast hold of an inexhaustible subject. It will keep an old man young. The psalmist recognises his task, which is also his joy, to declare God's wondrous works, and prays for God's help till he has discharged it. The consciousness of a vocation to speak to later generations inspires him, and assures him that he is immortal till his work is done. His anticipations have been fulfilled beyond his knowledge. His words will last as long as the world. But men with narrower spheres may be animated by the same consciousness, and they who have rightly understood the purpose of God's mercies to themselves will, like the psalmist, recognise in their own participation in His salvation an imperative command to make it known, and an assurance that nothing shall by any means harm them till they have fulfilled their witnessing. A many-wintered saint should be a convincing witness for God. Ver. 20, with its sudden transition to the plural, may simply show that the singer passes out from individual contemplation to the consciousness of the multitude of fellow-sufferers and fellow-participants in God's mercy. Such transition is natural; for the most private passages of a good man's communion with God are swift to bring up the thought of others like-minded and similarly blessed. "Suddenly there was with the angel a multitude of the heavenly host, praising." Every solo swells into a chorus. Again the song returns to "my" and "me," the confidence of the single soul being reinvigorated by the thought of sharers in blessing. So all ends with the certainty of, and the vow of praise for, deliverances already realised in faith, though not in fact. But the imitative character of the psalm is maintained even in this last triumphant vow; for ver. 24 a is almost identical with xxxv. 28; and b, as has been already pointed out, is copied from several other psalms. But imitative words are none the less sincere; and new thankfulness may be run into old moulds without detriment to its acceptableness to God and preciousness to men.